Jane has become a pretty good sleeper (knock on wood, cross your fingers, etc.). Traveling throws a few kinks in things, but overall she gets good rest, 11-12 hours per night. Right now we're sleeping in a room together, and she can hear us come to bed after she's been asleep for hours. It hasn't been a problem. But last night she woke up before we were able to fall asleep, and she cried and cried like she hadn't in a long time with real tears and that ragged "huh-huh-huh" breathing between sobs. Break your heart. We'd had a huge day with lots of playing and company and NO NAP (although she did rest in her crib for about an hour without sleep it's about the same as staying up and playing all day). She really sleeps better when she is rested, which is a crazy thing about kids' sleep. Anyway, she snuggled with us in bed for maybe 10 minutes and was fine/calmed down. When I tried to put her back in the crib the crying became hysterical again. 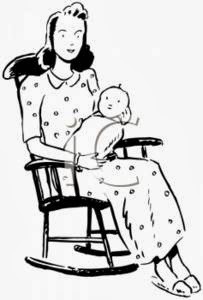 So I sat in the rocker and rock-rocked and sang once I got her to calm down and relax in my arms, which wasn't easy and took patience. I hadn't rocked her like that in months. She relaxed and sighed and even requested a song (Baa, Baa Black Sheep, naturally). Then she sang for me and I put her back in the crib with kisses and hugs. She slept through until this morning and woke up at her usual time, although thanks to the time change it was about 6:30 instead of 7:30. In the moment I wasn't too tired or anxious or upset. I just held her and rocked her, liking the feel of her body against mine relaxed and breathing deeply. Normally I count the rocks and think after 50 I'll try to put her down. Knowing how numbered our rocking days are becoming I held on and enjoyed it. Not sure that I'll feel the same if there's a repeat performance tonight!